Good morning! I have a sparkly, wintry Christmas card to show you today. 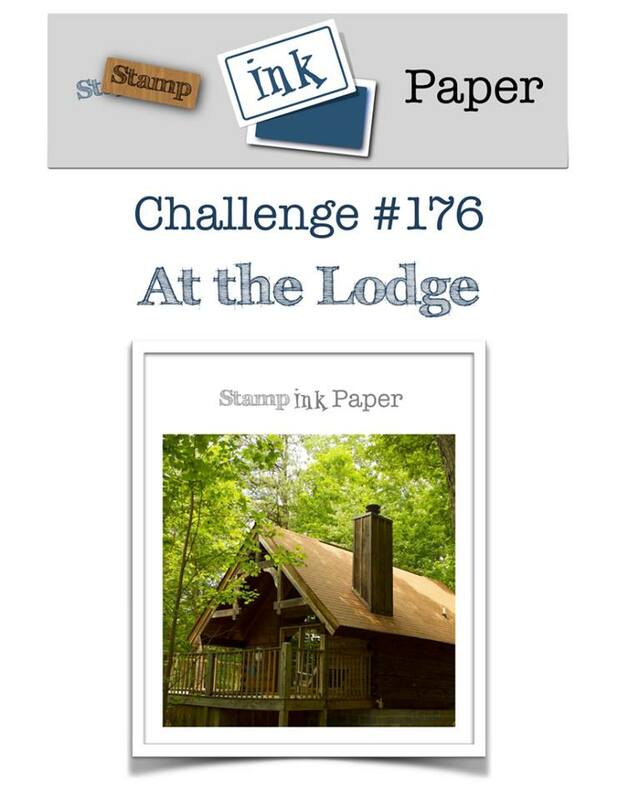 This is for our “At the Lodge” Stamp, Ink, Paper Challenge. Make sure to head over to the challenge blog and check out the design team inspiration. We’d love to have you play along this week! 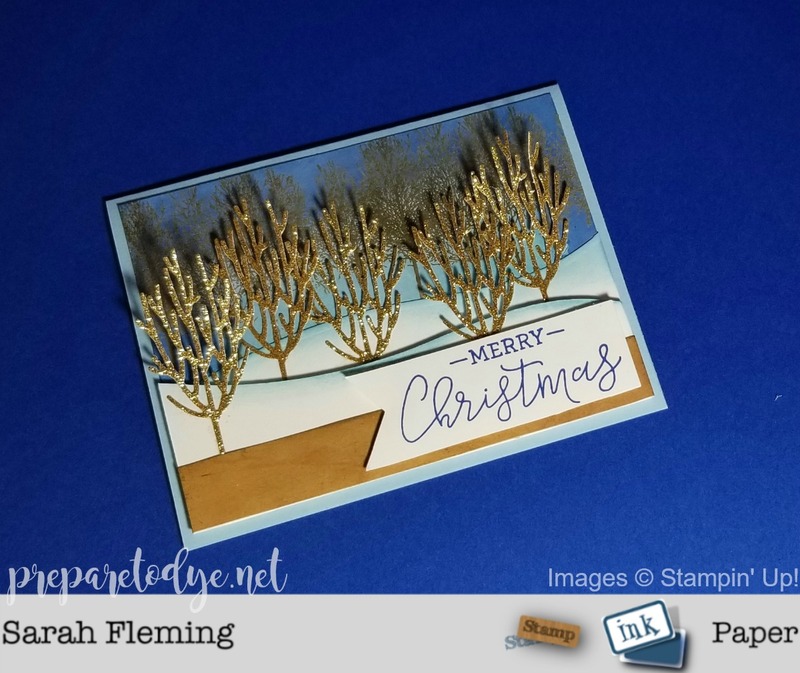 My card starts with a Balmy Blue card base, 5-1/2″ x 8-1/2″, scored at 4-1/4″. On top of that is a piece of Whisper White cardstock, 5-1/4″ x 4″. 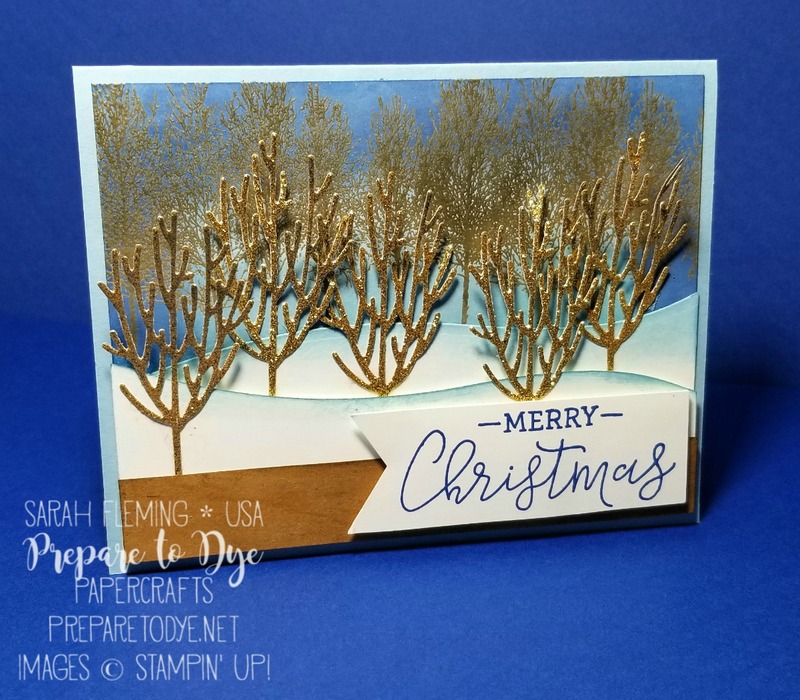 I heat embossed trees from the Winter Woods stamp set (which you can buy alone, or in a bundle with the In the Woods framelits for 10% off) using Versamark, Gold embossing powder, and the Heat Tool. Then I sponged on the sky using Stamping Sponges and Blueberry Bushel and Balmy Blue ink. I wanted to soften the sky and give it a kind of foggy look, since we’re at a lodge looking out the window, so I sponged on Whisper White Craft ink over the blues. I wiped off the trees with a dry cloth. I cut a second 5-1/4″ x 4″ piece of Whisper White cardstock, then used the curvy die from the In the Woods framelits to cut the snow. I made the cut about halfway up the cardstock and used each half to make a snow drift. I turned one of the pieces over so the two curves wouldn’t line up with each other. I sponged Balmy Blue on the top edges of the drifts, glued one down to the embossed piece, and popped the other one up on Dimensionals, then trimmed off the excess cardstock. NOTE: Do all of this before gluing the embossed piece to the card base. I cut five trees from Gold Glimmer Paper using the In the Woods framelits and added those with Multipurpose Liquid Glue, gluing down only the trunks and lowest branches of the trees. I glued down a 5-1/4″ x 3/4″ strip of Wood Textures DSP (this is the windowsill at the lodge), then added my sentiment. 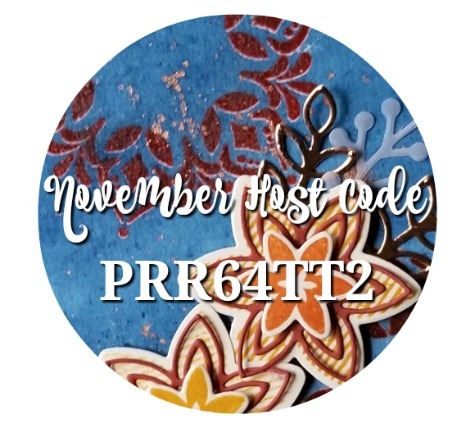 The sentiment is stamped in Blueberry Bushel and comes from the Warm Hearted host stamp set. I flagged one end of the sentiment with the Banner Triple punch and put it on the card with Dimensionals. It sounds like a lot, but this card was actually quick to make.